July | 2014 | Live Healthy S.C.
A few days ago DHEC Public Health confirmed the first case of chikungunya virus this year in a South Carolina resident. The case occurred in an Upstate resident who recently returned from a trip to Haiti. 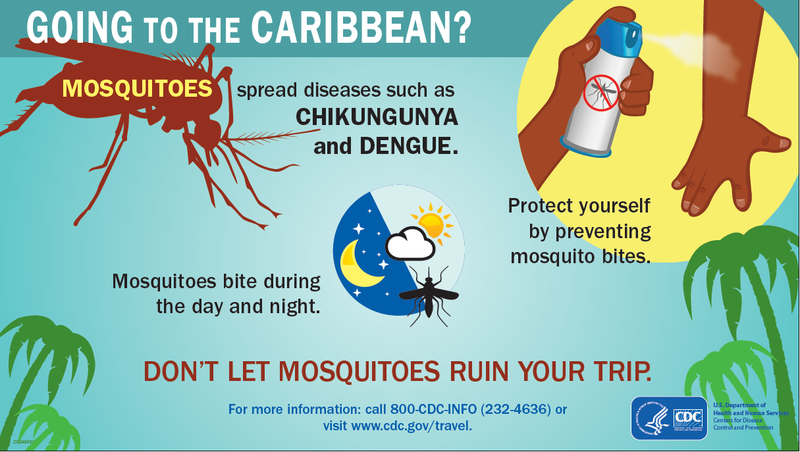 Chikungunya virus, a mosquito-borne illness traditionally found in Africa and Asia, was recently identified in the Caribbean. The symptoms of chikungunya are headache, fever, rash, joint swelling or muscle pain. DEET – Apply insect repellent on exposed skin and clothing when you go outdoors. Use an Environmental Protection Agency (EPA)-registered insect repellent. Permethrin sprayed on clothing provides protection through several washes. Don’t spray repellent on skin under clothing and don’t use permethrin on skin. Dress – Cover up. Wear long sleeve shirts and long pants and socks while outdoors to prevent mosquito bites. Dawn and dusk – Reduce exposure to mosquitoes during the early morning and evening hours when they are most active. It is important to wear repellent at that time. Drain – Eliminate all sources of standing water on your property where mosquitoes can lay their eggs, including flowerpots, old car tires and pet bowls. For more information on how to prevent mosquito bites this summer, check out our website. This entry was posted in Disease Control, Prevention and tagged chikungunya, mosquitoes, prevention, South Carolina, travel on July 15, 2014 by SC DHEC. Nothing says 4th of July here in South Carolina like grilling out and spending time with friends and family. One way people celebrate our nation’s birthday is with fireworks, and our Division of Injury and Violence Prevention is urging anyone using fireworks this holiday weekend to do so safely. Every year thousands of people across the country are injured by improperly handling fireworks and South Carolinians are no different. In 2010 there were 182 injuries, including serious burns, contusions, and other trauma resulting in 177 people treated in hospital emergency rooms across the state. The risk of fireworks injury is highest among people ages 15-24. 23% were under the age of 18. This entry was posted in Community Health, Prevention on July 2, 2014 by SC DHEC.